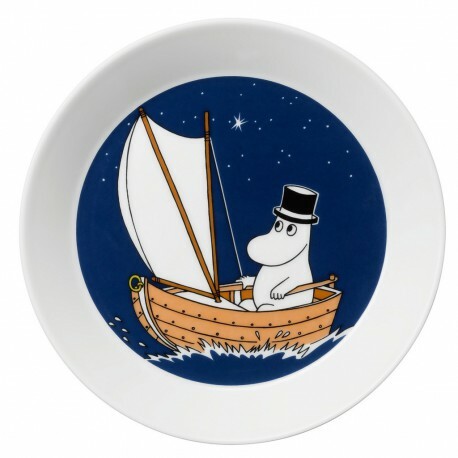 The new Moominpappa plate features illustrations by Tove Slotte, it shows the adventurous Moominpappa sailing. The dark blue plate goes well together with everything. Orphaned in his younger years, Moominpappa is a somewhat a restless soul who left the orphanage to venture out into the world in his youth but has now settled down, determined to be a responsible father to his family. He is almost always wearing his black top-hat, inside which is painted, "M.P. from your M.M." to differentiate it from all the other top hats in the world. Moominpappa also lived on a ship with three Hattifatteners for a few days, observing their behaviour.